She played all the time, then stopped at around age sixteen. She put the guitar away while she raised her child. In her forties, Libba became housekeeper to American folk music specialist, Ruth Crawford Seeger. (Ruth was the mother of Mike and Peggy Seeger, stepmother to Pete Seeger) While working at the Seeger’s, the house was filled with music day and night. And, once again, Libba heard music. 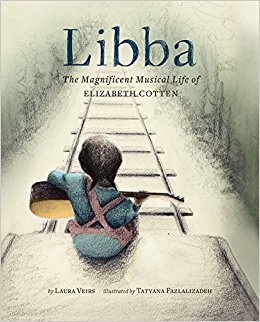 For the rest of her life, Libba never stopped singing. She died in 1987 at age 94, Her most famous folk song, 'Freight Train', was recorded by Peter, Paul, and Mary, Bob Dylan, and even The Grateful Dead, to name a few! The book is enhanced by the illustrations of artist Tatyana Fzalaizadeh. Rendered in graphite and digital color, the artwork uses muted tones that bring the narrative alive. Back matter includes an extensive author’s note and a bibliography of works cited. Share this book with students of all ages. Round out their experience by playing some of Cotten's cds you've checked out from your local public library. Her voice is so graceful, engaging, and you will agree that she does sound like a thousand songbirds singing. Click here to hear Libba Cotten perform a song written with the help of the four generations of children and grandchildren she took care of...'Shake Sugaree'. Click on this link to hear the author, Laura Veirs, who is a singer-songwriter, performing Freight Train. 💖💖💖ed this book. Very inspiring & moving! I love how we can meet new people and learn so many fascinating stories from the great biographies being written for children! Thanks for sharing this one!